Feature's lots of previously unseen footage. Some could view it as too long. From Bedrooms to Billion's is a fantastic documentary focusing on the rise and fall of the British Video game industry during the 80's. Starring: Peter Molyneux, Jeff Minter, Dave Perry and many more. Available to watch via DVD/Blu-Ray & Netflix. I haven’t seen many documentaries that cover video games and their history, and of the few that I have seen such as Video game: The Movie and Atari: Game Over, the focus is aimed more towards the rise and popularity of the American/Japanese video games industry. Yet within these few documentaries one area seems to be constantly overlooked, if not left out altogether. However directors Anthony and Nicola Caulfield set out to fix this little issue in 2014 with their documentary From Bedrooms to Billions. 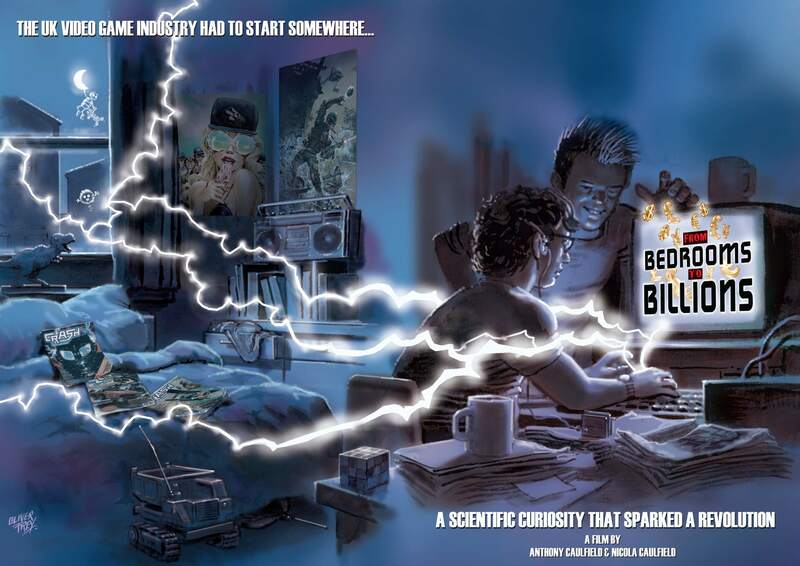 As originally planned, From Bedrooms to Billions was intended to be a 3 part television show, but due to UK Broadcasters believing that the video games market was too niche, it was never commissioned. This didn’t deter the eager directors though, and turning to crowd funding, they got their film made. Told in 3 parts, the documentary focuses on the rise of the industry, the steady level and finally the gradual fall due to the rising popularity of both American and Japanese games, which as the observant might see, is covered in the opening credits. Focusing on the rise and fall of the UK’s video games industry during the 1980’s, From Bedrooms to Billions offers an extensive insight into the lives of a small group of bedroom developers who decided to create their own games, resulting in a movement that turned the world of video games on its head. It may come across as an extreme statement, but as From Bedrooms to Billions shows, the effects of the UK’s rise to dominance in the video games industry are still being felt today, with many of the original developers now working in high positions for the American video games industry. One of the key things that makes this documentary so enjoyable is the lack of narration throughout, with the film being carried along by a collection of wonderfully shot interviews intertwined with a great selection of archive footage, (some of which has never been seen before), in a film that is clearly dedicated to the enthusiasts of that particular era. The cast is impressive, with people such Jeff ‘Yak’ Minter, (the ever friendly founder of software house Llamasoft), the elusive creator of Jet Set Willy Matthew Smith, and computer composer Martin Galway, who gives an insight in to what happens behind the scenes. The result is a fantastic well-structured documentary that both directors have created by bringing these individual stories together. On more than one occasion, the UK video game movement of the 80’s is compared to the earlier punk movement, with references and images to various icons from the punk era making an appearance. I don’t personally agree with the comparison as the punk era was seen as a generation who wanted to fight back against a system that they believed was flawed, whereas the original developers had to pave their own way with technology that had never really been used before. At around two-and-a-half hours long, From Bedrooms to Billions can certainly feel like a lengthy documentary, (my first viewing was done in 3 segments) but it never felt like it was a chore to watch due to the overall enthusiasm and enjoyment of all those who featured in the film. The knowledge is extensive and interesting and for someone such as myself, who grew up in an age where the big American/Japanese industries were already starting to take over, (I myself was lucky enough to have an Amstrad CPC 464 as my first gaming machine) it’s a brilliant insight into video game history, and how a bunch of bedroom coders from the UK helped shape the industry we know and love today.